Duct work installation is a key operation in the furnace, water boiler and air conditioner fitting and maintenance. Faulty duct work and venting can lead to loss of heat and cause surged energy bills. Here are 5 things that HVAC ductwork installation specialists recommend during fitting and maintenance procedures. All dryer and blower ducts used in the air conditioner and heaters should have a uniform diameter. The optimum diameter established is 4 inches as recommend by the HVAC contractors in Toronto. The said value prevents leakage from the pipes and also ensures that the opening remains free from dust and slime deposits. A vent with 4 inch diameter is easier to clean, ensuring frictionless flow of air through thee ducts. Hot air tends to create pressure inside the pipeline and ducts. Any blockage in the vent or duct will lead to leakage and bursting in the future. In case of a high efficiency gas furnace with a 5-star energy rating, it will require extra attention. In vents installed outside the exterior wall, there is a high possibility of blockage due to infestation of pests and birds. In some cases, the pests and birds die out inside the ductwork and decay there. It causes a foul smelling blow from the heater and furnace vents. That’s why, any venting maintenance on furnace from sale should check for unobtrusive flow of air. If you are investing in the HVAC equipment from a rental agency, it is highly recommended that you opt for a flexible ductwork installation. Flexible transition in piping and ductwork allows better connection through different wall contours. The flexible ductwork installation using aluminium flexi-ducts are preferred over plastic or vinyl ducts. Ductwork exposed to external conditions is susceptible to atmospheric condensation and corrosion. Moreover, the exposed pipeline runs the risk of bacterial infestation and moisture-ridden walls. HVAC contractors Toronto recommends use of rigid, GI metal or aluminium alloys to conceal the ductwork installation. Your furnace’s vent maintenance is incomplete without the concealing procedure. 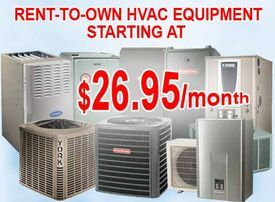 HVAC contractors in Toronto offering furnaces and boiler units on rental hire only specialist installation personnel. The experts have the skill set and the expertise to handle duct work installation and AC installation procedures that requires use of metallic tape. The securing of duct and fitting the vent in proper direction is a pivotal step in tankless boiler installations. In addition to the concealing part, the duct joints are required to be installed in such a way the male end of the duct points in the same direction as the flow of the air. Use of screws and rivets is totally prohibited. Moreover, the ductwork system and venting maintenance is independent of the chimneys and the exhaust vents. Investing in a good furnace from sale from HVAC contractors in Toronto means you should also get your ductwork installation done from specialist maintenance professionals.